'Sustainable Development' doctrine clearly requires us to spend more time recycling, while consuming and working less (for us in affluent countries like the UK that is). The question is how, and which recycling is more enjoyable and meaningful than planet damaging consumption? Burn it, pulp it, compost it, origami it. Really really easy DIY transformational material. 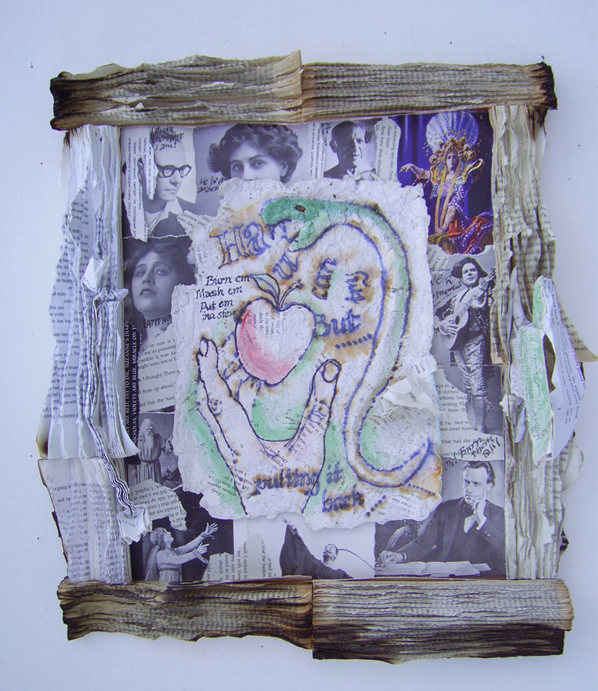 Paper and cardboard mixed with grass cuttings in the compost heap. 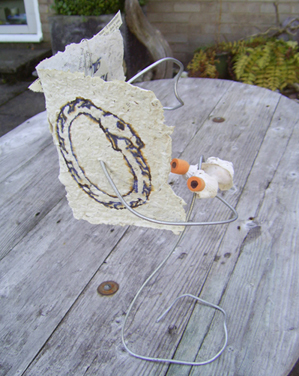 Card - homemade paper, shell, ear plugs, wire, and ink pen drawing. (By me). Chocolate paper origami eagle by Jazzy Cousins (13). Woodstoves offer excellent exercise possibilities - chopping, stacking etc. If you're not collecting locally unused trees you're paying your cash to a near neighbour to do it for you rather than a global energy corporation. If you've space for log heaps and don't live in a smokeless zone there's no downside here. And in it you can throw all your junk mail, all the stick components of your green waste, and any other burnable non toxic part of your waste stream. Some experts claim wood is too land hungry, needing 5 acres or more to provide enough fuel for a house. 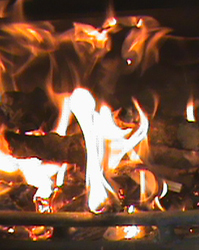 There are several variables statisticians could have been using for this figure, the household may have been single glazed without insulation, and the wood collected by professional logsmen who only take the economically retreivable and processable tree trunks leaving half the tree behind. For people with a well insulated house, 'recreation time' and access to woods the maths is quite different as far more wood would be recovered and less acerage would be needed. Unfortunately sun's an infrequent visiter here in the Forest of Dean so my family re-re-functioned it as a pond one cloudy month. Low eco gain option, but very pleasant. Dalek by Laurie Cousins age 7. 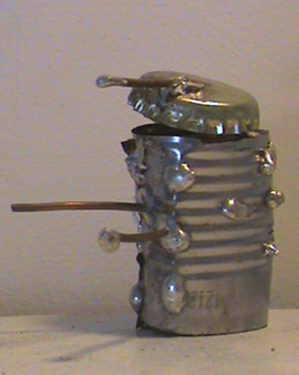 Tin can, bottle top and solder. 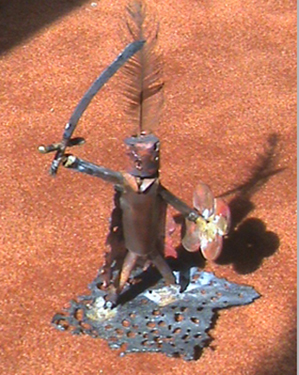 Knight - braising, copper, money, nails etc, by Jazzy Cousins age 12. The problem with jam making is that what ever quantity you make, it takes the best part of a day, to gather, prepare, cook and clean up, and then you've got too much jelly/jam and end up with cupboards full of the stuff for years. But if you make a jelly, 2/3 of which you remove from the heat before it reaches it's setting temperature, you can then use this as a kind of cordial (ribena substitute), or add it to yogurt and whipped cream at a later date to make ice cream. You quickly get through jars of the stuff if you've a couple of kids, and the amount effort and the economics start to make a bit more sense. 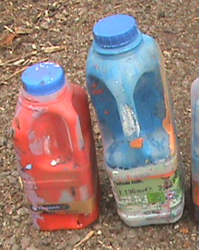 These versatile shapes have obvious re-use value for mural painters as paint pots (especially those who work in schools), but can also be re-fashioned for a wide variety of purposes. The pipe took a lot of time to make, and only gets the water half way to where I really want it, I think I'll have to use discarded gutters to get it the rest of the way. 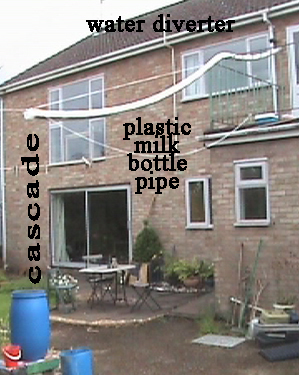 This one is definitely more effort than it's worth, but it has taken on a symbolic meaning for me, plumbing is one of the main benchmarks of civilisation, I'm getting water from my drains to the veg patch using rubbish. 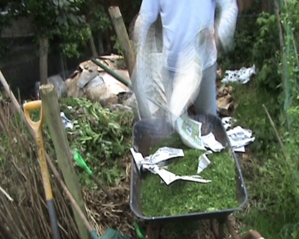 Compost heaps are easy, you can work out a system for even a tiny garden/yard. Composting gets rid of a large part of your waste, the part that gives landfill operatives the hardest time. It takes nominal effort, helps your garden grow, and turns waste into fertility. It's obvious, not to compost if you have even the smallest garden is madness, literally, a mark of some sort/degree of insanity. 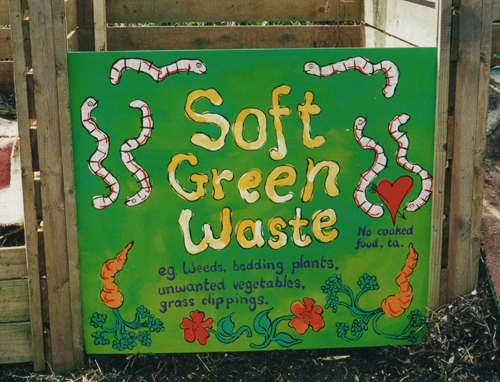 Sign for Warmley Community compost site, Bristol, 2002. 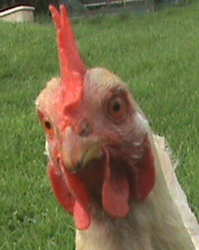 Chickens'll scoff a lot of what you'll turn your nose up at, make eggs, and are a total laugh. This is Reaper, she roams the garden during the day and sleeps in the garage at night, though she'd prefer to move in with us. It's said you should not feed chickens meat products especially of foreign origin since they may introduce foreign diseases, and dairy products, but I believe a moderate amount of bread, rice and pasta is OK. 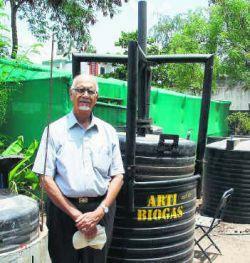 I was so inspired by this website for Arti Biogas Plant for processing food scraps to make bio gas to run your cooker, that I designed and built my own biogas plant. 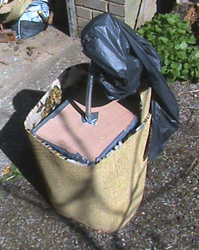 rubbish sack, and carpet insulation layer. Only trouble is I didn't read the small print, biogas activity only happens over 15 degree C. My garage isn't that hot so all I got was preserved food scraps sourced from the pub. Despite my best debating skills my family wouldn't let me install it in our bedrooms so it went onto the compost heap. But I love the idea. 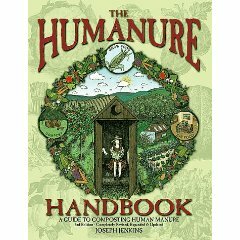 In 'The Humanure Handbook' Joseph Jenkins describes his compost toiletry and scrap food system. Everything goes into a bucket and onto the compost heap and then well covered. To comply with UK Health and Safety legislation you would have to do shed loads of paperwork and pay off the Planning Department to follow this system, so you're not going to find many Brits confessing to crapping in a bucket and putting it on their compost heap. Fear of paperwork and another bill aside, care and thought would have to be taken, as poorly executed humanuring could easily spread disease. But the science behind the system is carefully explained so it should be possible to do it safely. I have imagined doing it, it costs next to nothing, is odour free, reduces water bills, creates compost, and combined with cleaning out the chickens, a well earthy experience. Seems rationally near perfect as far as I can make out - big eco gain, bill reducer, reasonable time consumer - but it is culturally and legally challenging in the UK. In order to keep the compost heap bio-digestingly hot it does need a regular supply of organic material to keep the heap well fed so it's not for small garden owners. A variation on the theme is the treebog. 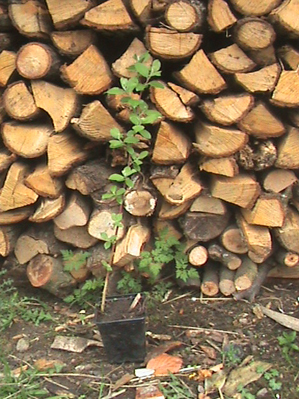 The humanure is used to fertilise trees directly and therefore negates the handling of compost and the incumbent Health and Safety paperwork. 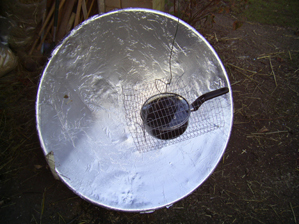 It's design normally includes an elevated toilet cubicle, but for the residential garden a bucket could be used as the toilet, and the contents emptied onto a willow surrounded dry heap, combining the humanure's collection technique with the treebog's composting. It is smell free and doesn't require so much added organic material. For long periods of time people have paid to collect urine for processes like making salt peter and tanning. It is amazingly useful. Here's a urine powered generater built by school girls in Nigeria which I'd like to try replicating if I find time. My use of urine is as a liquid manure With low levels of pathogenes it is relatively safe to handle. Diluted 1 -5 with water it can be used to water most plants, and at 1-3 can be used on trees and bushes. If you have any off the ground nutrient hungry vegetables suffering from soil exhaustion and looking a bit yellow, like sweetcorn or runner beans, a regular liquid manuring picks them up in no time. The plants use up the liquid manure quickly, so once you've started feeding them you have to keep going or else they'll grow fast and then suffer from dieback. Most of the Forest of Dean where I live is served by old sewage treatment works which routinely flush raw sewage into the Rivers Wye and Severn in heavy rain. Why pay (water charges to flush the toilet) to polute your environment when you can make your sweet corn taller? Hydroponics growing systems, like NASA's Controlled Ecological Life Support System relentlessly pursue the logic. Sewage and carbon dioxide plus plants equals food and oxygen for spacepeople. 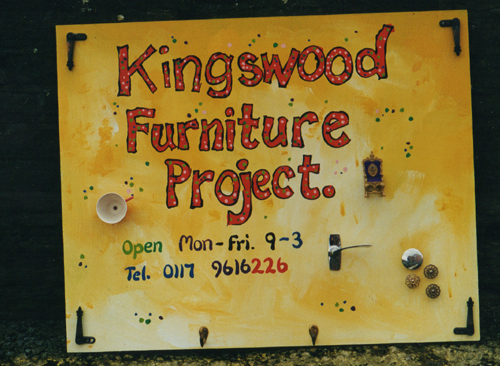 Sign for Kingswood Furniture Project, Bristol, 2002.